Montreal’s residential urban environment is quite different from those of the others big cities. It is difficult indeed to walk in the streets, made of row upon row of three storey houses, without noticing the typical outdoor staircases that shape the identity and the image of the city. These three storey houses, also called ‘triplex’ or ‘plex’, are subdivided in three flats, one per storey, and also exist in two storey version or more. Introduced by British colonists, these row houses were mainly erected in the thirty years before the twentieth century when the attractive employment opportunities in the city caused a boom of population. 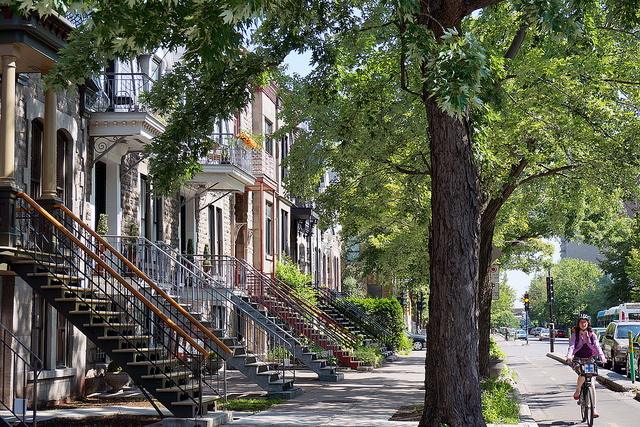 According to the research report ""PLEX" Housing: A Renewed Tradition" from CMHC, the typical model of Montreal’s urban environment is one longitudinal lane with two crossing lanes serving the rear of the buildings. This organization promotes social interaction rather than isolation and contributes to limited urban sprawl with the high occupation density of 350 persons per hectare. For a Triplex, the average dwelling plot size is 14.3 to 15.2 meters by 26.5 to 29 meters with two dwelling units on each plot. The typical floor area ratio is 1.4 and thesite coverage is 0.6. Triplexes organization allows flexible housing compartmentalization. Each floor is able to welcome one family, which makes three in total. For a more comfortable place, the two upper floors can gather into two apartments of two stories. This organization makes a lengthwise distribution into narrow apartments. In a typical one story flat, the living room and bedrooms are located on the street side with the kitchen and other utility rooms facing the backyard or lane. An advantage of these houses is their organization. In fact the stacked units conserve heat and warmth is shared between apartments, there is no lost to the outside concerning two façades. Added to this minimal heat loss, the openings front and back provide effective ventilation and abundant natural light. A possible transplant in Vancouver ? Vancouver's typical lot size is 33’ by 122’ ( 10x37,2m) which is broader than Montreal ones ( 7,1 to 7,6m x 26,5 to 29m). It means that in two Vancouver lots it is possible to fit almost three Montreal dwelling units while gaining enough place for a garden or a laneway house for instance. Most Vancouver's houses are only two-storey high. 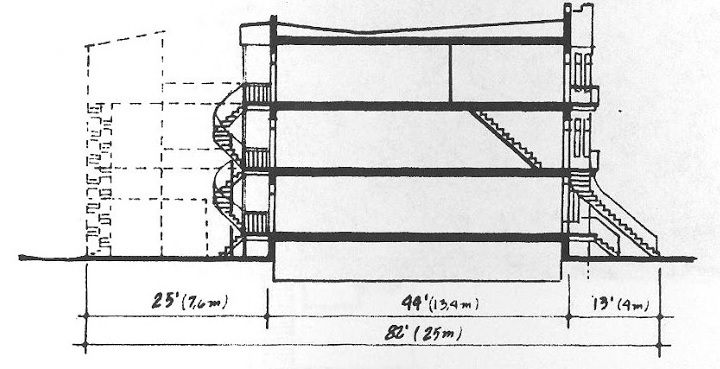 Meanwhile the Montreal's triplexes with their three storeys have a higher FSR. 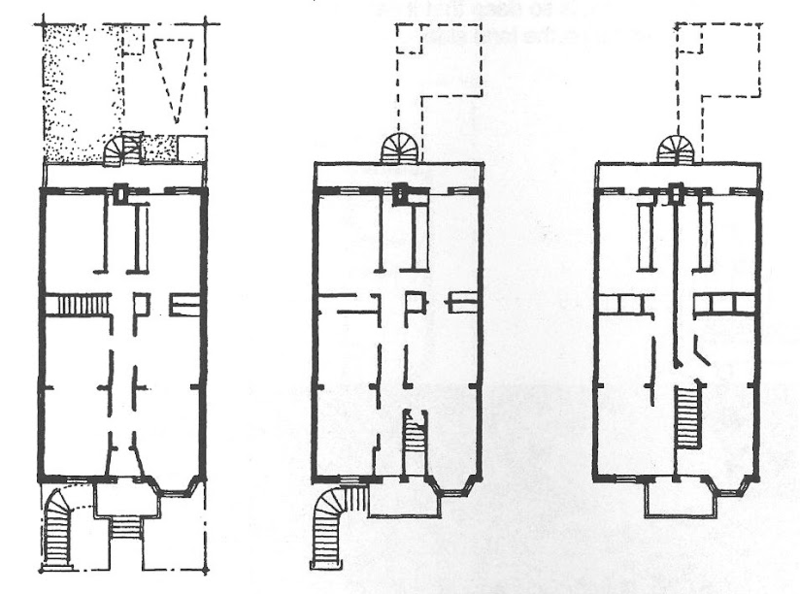 Thinking about Montreal's triplexes as an inspiration for a new housing model for Vancouver's streets could be a way to improve density of the city and to reduce heating demand due to the compact shape of the buildings. These 3D models allow to have an idea of the size distinction between Montreal and Vancouver lots. Here is an idea of what a group of Triplexes could look like in a Vancouver's street.